Husband to Emily. Father to Blakely. Uncharted Trail adventurer. 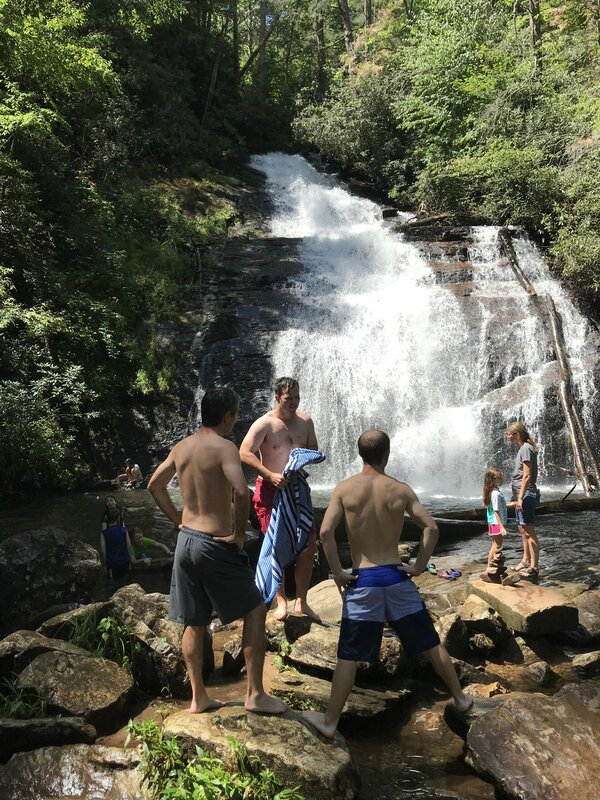 I had the real pleasure of joining Mikey and 3 of his closest friends early in August for an Uncharted Trail weekend in the North Georgia mountains. After some hiking, intentional conversations, hot tub time, waterfall swimming, and a few heated games of Settlers of Catan late into the night it's easy to see why Mikey is so loved by his friends and family! I was introduced to Mikey through a shared acquaintance while his daughter Blakely was still in utero. Blakely was diagnosed during pregnancy with alobar holoprosencephaly, a condition that comes with a pretty discouraging outlook: many children with this diagnosis don't survive childbirth or live much longer after birth because of the compromised brain development. Knowing that I had gone through something similar with my son, Ezekiel, our mutual acquaintance connected us so I could share some of my insight and experience with Mikey. We talked on the phone a few times and texted some, but I had never met Mikey in person before this weekend. Without going into too much detail, thankfully Blakely DID survive childbirth and lived a beautiful (and difficult) 10 months before passing away. Mikey chronicled his family's journey in a much more beautiful way than I ever could at https://blakelybumblebee.com/. After Blakely's passing, I reached back out to Mikey to offer him an Uncharted Trail weekend experience. After sharing the vision, he was hooked! It takes at least 2 months to coordinate the right weekend, contact the friends, and make the accommodations necessary when customizing an entire weekend, but Mikey was looking 5-6 months down the road because of his summer work commitments. The longer timeframe worked to our advantage because finding a common weekend where 4-5 people all from different cities can meet up is definitely a challenge! Thankfully, 3 of Mikey's longest-running and most intentional friends were able to make it for a weekend we'll all remember! All of our crew was traveling from Florida and south Georgia, but Mikey wanted a weekend in the mountains, so we made the most of our 8+ hour road trip up I-75 to Blairsville, GA, which is about 2 hours north of Atlanta, with some time getting to know each other, hearing each other's stories, and laughing about the dumb stuff dudes talk about on road trips. The guys did me a huge favor and opted to travel through Athens on our way to Blairsville, so I was able to show them around beautiful North Campus of my alma mater, The University of Georgia, and treat them to my cheap college restaurant of choice, Barberitos. We also took a chance to ring the historic Chapel Bell...even though they weren't sure if I was setting them up to get in trouble! Treating some FSU fans to the true "Harvard of the South"! After dinner in Athens, and a beautiful ride up through the mountains, we made it to our cabin ready to rest and truly start the weekend. We made it to the mountains! The first intentional conversation on an Uncharted Trail weekend is all about "Now". We give our main adventurer the opportunity to share openly and honestly about how the tragedy and trauma they've endured has changed them. It takes some soul-searching and a deep commitment to brutal honesty, but it's the most cathartic experience of the weekend. It's one of those "what happens on the trail, stays on the trail" conversations that some might call sacred. I'll suffice to say that Mikey's love for his wife and his daughter was on full display... and we all resorted to a roll of toilet paper because I forgot to buy tissues for the night! After getting out more tears than most of us usually share amongst men, we hit the hot tub! Nothing quite like 5 dudes in a tiny hot tub to accelerate the bonding process! No, it's not a time machine. Saturday is the big adventure day! 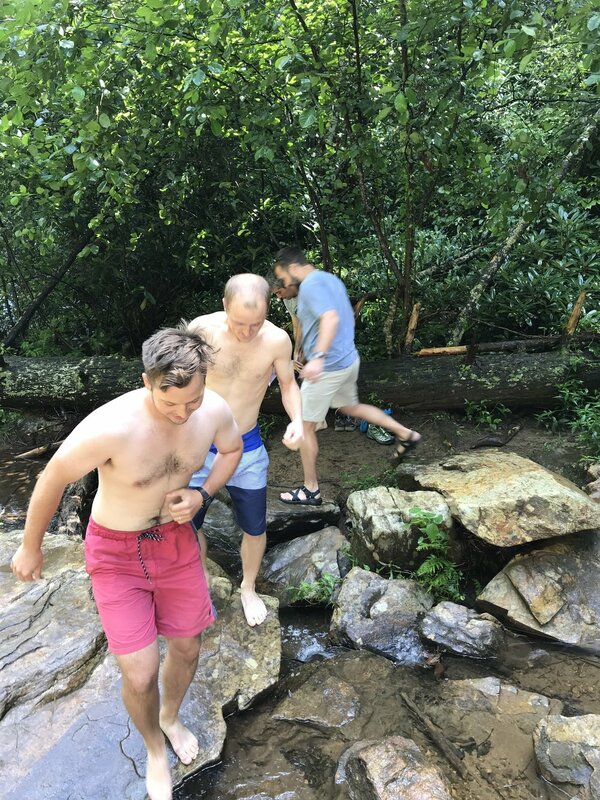 We took on a hike from Vogel State Park up to the Blood Mountain summit on the Appalachian Trail up 2,250 ft of elevation change through the nasty Georgia summer humidity. Over 9.5 miles. 4+ hours. At least 1600 calories burned. Literally puddles of sweat. A power nap on the summit. A dip in the lake after the hike. And some authentic southern BBQ when we were all done. The final two intentional conversations on an Uncharted Trail weekend are titled "New" and "Next". NEW basically asks - "Who do you want to be and what do you want to accomplish in this next season of life?" NEXT helps clarify - "How can we, as your community, best love, serve, and keep you accountable to healthy, productive living going forward?" We tackled those subjects Saturday night & Sunday morning. But before we finished off the weekend with a long ride back to Florida, we had one more challenge to overcome. A waterfall polar bear plunge! 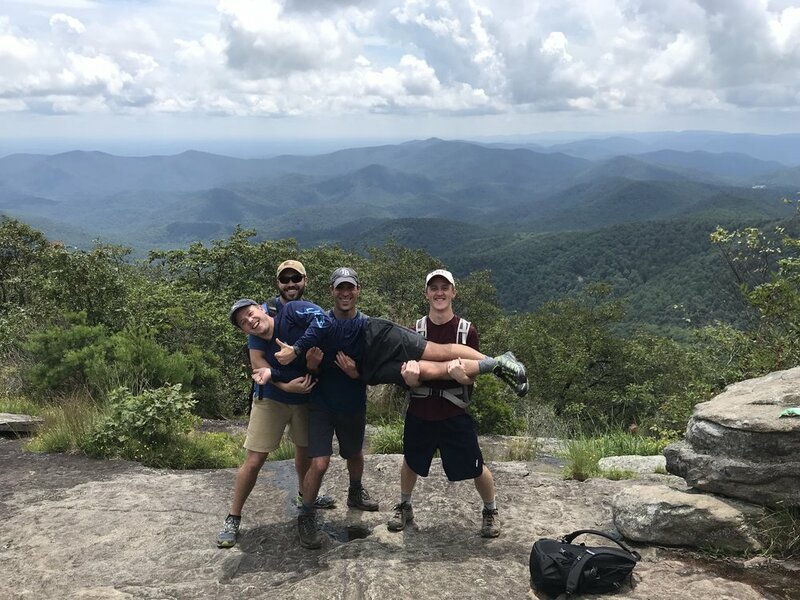 Thank you to Mikey, Jason, Boyd, and Skylar for taking on an Uncharted Trail weekend with full hearts and no hesitations! Thank you to Mikey's wife, Emily, for encouraging and empowering this opportunity for Mikey and the crew. And thank you to Blakely, for making Mikey a better man.